Gladiator is a perfect example of the classic ‘hero’s journey’ in storytelling. In this comprehensive analysis by Daniel Dercksen, we take a closer look at the structural development of Gladiator, as well as character development, symbolism and visual dynamics. We will also examine some of the differences between the revised first draft written in April 1998, and the second draft written in October 1998. ACT II: It focuses on physical and emotional conflict and confrontation – Maximus’ training as Gladiator and his days of glory as Gladiator in the Coliseum. This is the rebirth of our hero. ACT III: After Maximus fails to escape from Rome and is imprisoned, it sets the platform for the final confrontation between the hero and the Antagonist, and allow the hero to achieve his ultimate goal: to return home to his family. It is interesting to note that the action sequences – the battle of Germania, and the Gladiator fighting scenes in the arena – comprises 29 minutes of the entire 150 minutes of film. This clearly indicates that we are not dealing with an action film, but a Historical Drama. Director Ridley Scott delights in taking worthy and likeable characters in his films on epical quests into imaginary and truthful worlds, filled with adventure, spectacle, and wonder: the resilient Ripley confronted a nasty creature in the science fiction nightmare Alien; a hardboiled New York cop battled a yakuza hood in Japan in the crime thriller Black Rain; a retired law enforcer destroyed vicious replicants in the futuristic thriller Blade Runner; swordfighting and gun battles within the Napoleonic wars dominated The Duellist; Columbus’ unyielding expeditions were explored in 1492, Conquest of Paradise; a heroic young peasant confronted the devil in Legend; a New York cop protected a socialite in Someone To Watch Over Me; two regular girls became dangerous outlaws in Thelma & Louise; a group of boys underwent the rites of passage in White Squall; Demi Moore toughened up for G.I.Jane, General Maximus conquers an evil-minded Roman Emperor circa 180 AD in the $100 million epical adventure Gladiator; we followed the further exploits of Hannibal Lecter in Hannibal, the sequel to Silence of the Lambs; and we experienced the horror of urban warfare in Black Hawk Down. 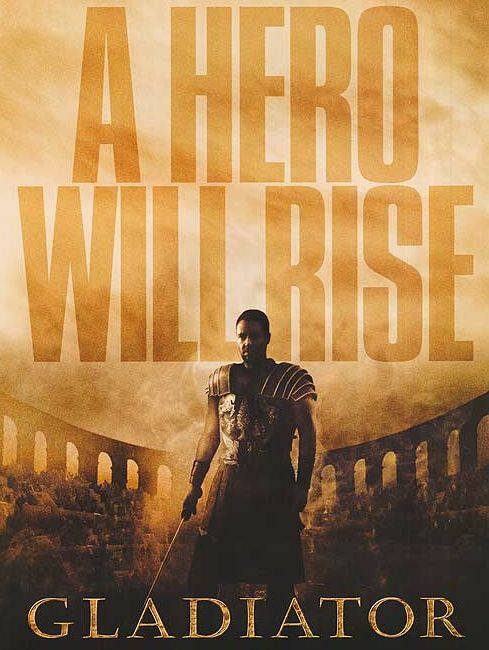 The film Gladiator was one of the first films in history to be greenlighted before the script was complete. It was David Franzoni’s story, his pitch to Dreamworks, the concept, and the pitch to director Ridley Scott, that initiated the process. The first draft of the screenplay for Gladiator was written by David Franzoni , based on his own story. Director Scott felt that because this draft jumped immediately to Rome after the opening battle scene, he needed more exposition in the first act and called in John Logan for a rewrite when Franzoni had burn out. Once the rewrite was complete Scott felt that he needed a rewrite on the characters and dialogue and called in playwright John Logan for a further rewrite., focusing on the characters. Once this draft was complete and the actors did a reading, the producers noted that there was still something missing and called in an expert on plot and structure, William Nicolson. As an outsider, who knew nothing about the project, he read the new draft and sent a 10 page fax to producer Walter Parkes, outlining the problem areas. It was during this draft that the idea of an afterlife surfaced. Before we are introduced to the great warlord, General Maximus, the audience is given some graphic exposition – backstory – quite similar to other epical films such as Star Wars or the 1922 Robin Hood. Exposition is a key element in the craft of screenwriting. It is information necessary to move the story forward and can be set up through dialogue or be dramatised through pictures. In Gladiator it is set up through written dialogue. We learn that it is the winter of 180 A.D. The mighty Roman Empire has conquered the entire Europe except for Germania. General Maximus is about to lead his 5000 men into battle. We are now ready to meet this great General. What will the first and most important visual image be? The first visual director Scott gives us of this prodigious war hero, this fearless fighting soldier, is a flashforward depicting the hero’s spiritual journey: we view a close up of Maximus’ hand gently stroking and touching wheat as he slowly strolls through the field into what we will later discover as his vision of the afterlife. We see his face. He is pensive. Serious. Before he turns to face the real world he watches a bird sitting on a branch, a symbolic image representing the freedom he desperately seeks. He smiles, knowing that soon he will be home. We know that our hero is a compassionate human being; there is an immediate bond that is established between the audience and the protagonist. A great warlord is shown as a man who has an inner strength, a gentle sad sensuality. It is interesting to note that this moving opening scene was not conceived by the scriptwriters, but by Scott. – during the last week of filming in Tuscany Scott sat pondering over finding a perfect opening for the film. He watched Crowe’s stunt double brushing the wheat and found his perfect opening, an ideal journey toward the end of Maximus’ journey. Scott found his opening shot. This striking image resonated with the theme of mortality that sounded through the story. Scott filmed this image and used it to launch the hero into the story, towards an ending that was inevitable and clearly mapped out. A column of Praetorian Cavalry flank two enclosed wagons as they rattle along a rock and log accordion road. On all sides a forest rises like some kind of primordial soul: limitless and dark. With every step ‘steam’ whooshes from the nostrils of the horses. Germania. The far reaches of the Roman Empire. Winter 180 A.D. Incongruously enough, the first sound we hear is a beautiful tenor voice. Singing. A boy’s voice. CREDITS as we hear the haunting song float through dense forests. We finally come to a rough, muddy road slashing through the forest. On the road a GERMAN PEASANT FATHER is herding along three sickly looking cows. His two SONS are with him. His youngest son sits on one of the cows and sings a soft, plaintive song. They become aware of another sound behind them on the road — the creak of wood, the slap of metal on leather. The Father immediately leads his cattle and his sons off the road. They stand-still, eyes down: the familiar posture of subjugated peoples throughout history. A wagon train rumbles past them. Three ornate wagons followed by a mounted cohort of fifty heavily-armed PRAETORIAN GUARDS. The young boy dares to glance up at the passing Romans. His eyes burn with hatred. The success of any screenplay or any story relies on its set-up. The writer has to set-up the story from page one. Without a strong set-up there is no story for every set-up has a pay-off. That’s why we watch films; to see what happens; to experience the pay-off. The first act of a screenplay sets up the story; this is followed by the confrontational second act; and the story resolves itself in the third act. Maximus, the protagonist, the hero who has to take the audience on an journey. We need to see him as a fighter and a family man. The set-up has to prepare the hero for his emotional and physical journey. This sets up strong conflict within the protagonist. Emperor Commodus, the antagonist, the Supreme Enemy, the power-hungry ruler who ambitiously and severely seeks love. The set-up has to mould Commodus as a man who has a physical desire – the have power and rule Rome – and an emotional desire – to be loved. Lucilla, Commodus’ sister, the Subsidiary Enemy, a widow who will protect her son at all cost. She too has a physical and emotional desire: her physical desire is to protect her son; her emotional desire is to love the man of her dreams (Maximus) and to be the daughter her father wants her to be. The dying Caesar, Marcus Aurelius, who wants to return Rome to its former glory and hand his power over to a suitable ruler. The set-up reveals that he sees Maximus as the son he never had. We are also introduced to Maximus’ loyal servant Cesaro, and his right hand man, Quintus: without them the final act is futile. The political turmoil and uproar in Rome: the people versus the senate; we have to understand what motivates and drives the antagonist. The relationship and understanding between Commodus and Lucilla; we have to set-up a conflicting relationship. The relationship and history between Lucilla and Maximus; we have to set-up a subplot to explian their history. . The loving relationship between Marcus Aurelius and Lucilla; we have to set up her motivation. The antagonistic relationship between Marcus Aurelius and Commodus; we have to set up a conflict that changes the destiny of all the characters in the story. In the first draft of the screenplay, we meet our hero. The second is NARCISSUS MERIDAS, General, Spanish Gemina Felix VII Army: dark hair, proud and though about Quintus’ age his face is like a map of a soldiers’s hard life. Narcissus’ eyes are locked on Marcus like the eyes of a long-suffering pilgrim on the icon of his single hope. The commanding General of the Felix Regiment, MAXIMUS, walks between two of the catapults. He is a striking and intense man in his 30’s. Like all the soldiers who surround him, he is caked with mud and exhausted. Maximus, the hero or Protagonist is in conflict with himself, his family and his world, governed by violence, corrupt politics and evil-minded adversaries. The hero possesses one characteristic which sets him apart from his rivals: compassion. While brute strength and intelligence are hereditary, compassion and humility must be learned. Before the hero is summoned to his quest, he must undergo a test of character to prove to himself worthy of the natural and supernatural assistance he will receive from helpers during the journey. Of all the tests, tasks and trials that will befall him, his first test is the most important, because it establishes his privileged statues. Once he displays his compassion, with his attached implication of humility, he can do no wrong. During the First Act see the hero display the strengths which earmark him as a potential hero. The success of any scene depends on two factors: begin a scene as late as possible and end it as soon as the function of the scene is fulfilled. Maximus has been waiting for two hours for the messenger to return from enemy territory with an answer: war or peace. A decapitated messenger arrives on horseback. Maximus knows that the answer is ‘no’. We learn that Maximus is human. We also learn further characterisation: He smells and touches the earth before going into battle. He is more than human, he is a man close to the earth. He is a farmer. A simple man. Before giving the signal to his men he introduces his dramatic need and we discover the hero’s personal goal. After his final battle he will return home to his family and resume his role as father and farmer. We also unearth his deepest fear, he may die in battle. He also underlines the theme of the film: “Strength and Honour,” and proclaims that “What we do in life, echoes in eternity,” referring to the importance of, and spiritual journey into the afterlife. Scott starts the battle in harsh, violent graphic detail, depicting Maximus as a fighter, before dissolving the hard images into slow motion, painting the screen with visions of brutal war: washed out colours and splashes of blood against the bleak landscape of winter, emotionally underlined by an excellent and lavish compelling music score by Hans Zimmer. All this is viewed by a silent and heavy-hearted Marcus Aurelius. The cavalry SLAMS into the Germans at full gallop … It is carnage. In the first draft of the screenplay there is a significant difference. We meet the character of Juba, whom Maximus only meets once he is captured as a slave in the film. NUMIDIAN ARCHERS, tall Africans, out of place in this freezing land, stand behind their leader — JUBA — who has the whip-like body of a dancer. Each carries his recurve bow as if it were a delicate musical instrument. Quivers of brightly colored arrows hang from their backs. We are 20 minutes into the story. We know who the hero is. We know what his dramatic need is – what he wants to achieve in the story. Now we are ready to meet the antagonist, the Supreme Enemy, the evil minded son of Aurelius, Commodus. In striking contrast to the horrors of war, we meet Commodus and his sister Lucilla in the warm comfort and safety of their carriage, en route to the battle front, escorted by an army of soldiers. It is an intimate moment. It is almost impossible to think of them as brother and sister. It is interesting to note how different Commodus is described in the first and second draft. Mist momentarily obscures a man’s face. Frozen breath. The man is in his 20’s, imperious and handsome. He is swathed in fur, only his face exposed. He is COMMODUS. The woman across from him returns his gaze evenly. She is slightly older, beautiful and patrician. A formidable woman. She is LUCILLA. a twenty-five year old ATTRACTIVE YOUNG WOMAN opens the door. She is LUCILLA. Commodus wants Caesar to die and rule Rome, Lucilla wants to take a hot bath after the long journey. He is irrational, over ambitious and fuelled by greed. She is in full control of her emotions, a practical scheming seductress. When Commodus waves goodbye to Lucilla and enters the battle field he apologises for missing the battle. Aurelius dismisses Commodus and pays full respect and attention to Maximus. A character is what he does. Action is character. He makes Commodus aware of Maximus’ greatness and his victory. We have met the hero, and have been introduced to the antagonist and the love interest – in the character of an ex-mistress. The dramatic premise has also been established: Rome, caught in battle and political intrigue, a metaphor of our hero, distraught by physical and emotional turmoil. When Maximus returns from battle, a scene that has been deleted features him in the hospital tent where he shows concern for his men. In the film we only see him outside the tent. The first thing he does is wash the blood off his hands, a symbolic reference to Pilate. Maximus then mocks the senate about their political ambitions. In return, they mock the fighter who wants to be a farmer. Commodus intervenes and makes his first remark about their ‘brotherhood’. Rome salutes you. I embrace you as a brother. A wonderful scene was written into the second draft. Maximus witnesses Commodus in mock-sword fight with the soldiers, revealing the Emperor’s Herculean fighting skills. Maximus is slogging through the mud and snow that blankets the Rome camp. He stops to observe an unusual sight. Commodus is stripped almost naked, his chiseled body covered in a fine sheen of sweat. He and his six CENTURION BODY GUARDS are going through their daily ritual. They defy the sub-zero temperatures and hack at small trees with swords. It is an eerie, zen-like workout. Commodus’ intense concentration is unnerving.